Added on July 25, 2014 by JETAA Southeast. 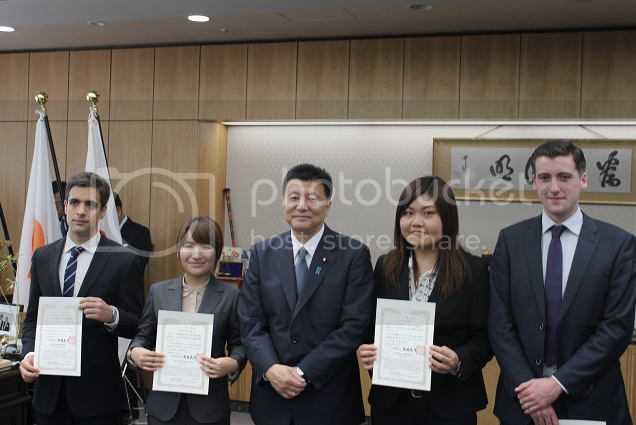 In appreciation of JETs' contributions to Japan, and to show how much they value us, all 1,450 JETs leaving the JET Program this summer are being awarded with a "JET Kizuna Ambassador" certificate by the government. The certificates have been sent to each local government. In case that some JETs have already left, local governments will be sending them out to the JET. On Friday, 4 JETs were honored directly by the Minister at the Ministry of Internal Affairs and Communications (MIC) in Tokyo. The ceremony was covered by TV media.